Freshman Brendan Beauregard will never forget how he spent the day on Sept. 15, 2017. Sitting in the living room of his family home in Medfield, Mass. texting his friends, he received a life-changing phone call from his mother. She told him he needed to come to Tufts Medical Center as soon as possible—his older brother, Pat, had been diagnosed with cancer. Brendan’s older brother Pat is a 30-year-old corporal in the Marine Corps and has stage IV colon cancer. 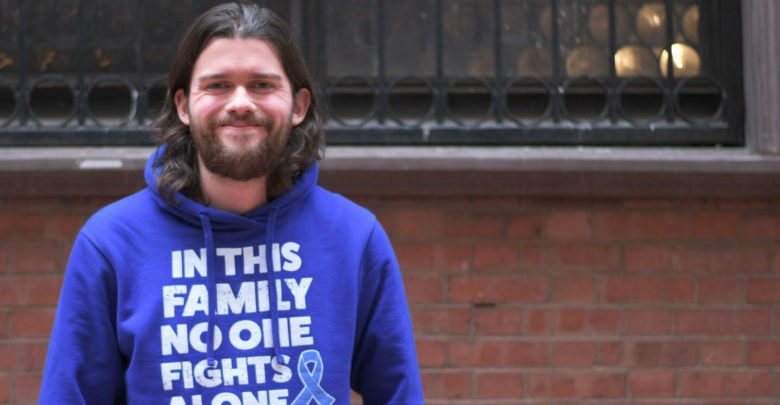 Since his diagnosis in October 2017—two months after his wedding—he has undergone surgeries, biopsies, scans, and 30 rounds of chemotherapy. 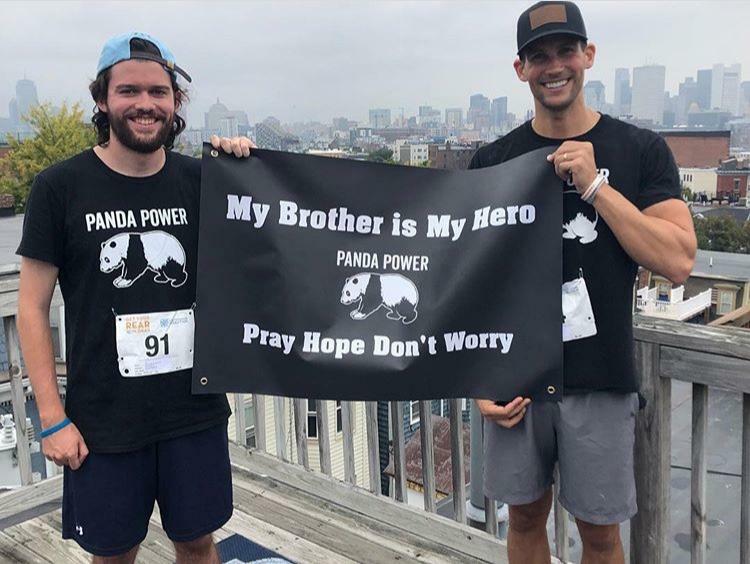 After Pat’s diagnosis, Brendan and his family participated in a 5K run in Boston called Get Your Rear in Gear in an effort to raise money for colon cancer research. After completing the run, Brendan directed his attention to an even bigger goal—running the Boston Marathon. Brendan said he wanted to make a difference for families impacted by cancer like his. At 19, Brendan is the youngest of his four siblings. Despite the age difference, Brendan said he considers his older siblings to be his best friends. They talk almost every day and watch their favorite Boston sports teams together and, according to Brendan, one of his favorite memories with Pat was attending a New England Patriots playoff game as a present for Pat’s wedding. Brendan (left) and Pat Beauregard (right) pose before the Get Your Rear In Gear 5K. Photo courtesy of Brendan Beauregard. Brendan said the reaction from friends and family to his decision to run the Boston Marathon was overwhelming. Brendan’s roommate, sophomore David Kemp, said Brendan’s drive and humility allow him to focus on helping those with cancer. Pat said he was surprised when Brendan told him he wanted to run the marathon, since Brendan has no prior experience with long-distance running. Brendan began his training after the 5K run, most recently completing the length of half a marathon as part of his preparation. Despite Brendan living in Boston, he does most of his training in his hometown Brendan said the hardest part about preparing for the marathon has been hill and elevation training. To participate in the Boston Marathon, runners can either qualify by finishing a marathon arranged by age within a certain time or by participating in a charity team, according to the Boston Athletic Association. Brendan joined the marathon team for a non profit called the Cam Neely Foundation for Cancer Care that helps provide support and resources for cancer patients and their families. By joining the team, Brendan had to raise $10,000 before April 15 to earn his bib for the marathon. 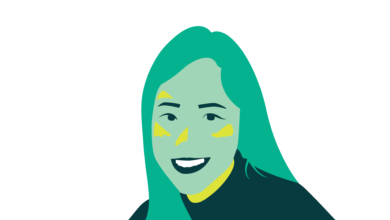 Brendan raised money through a CrowdRise page and by selling T-shirts with sayings from his brother on his own website. Pat said Brendan met his goal the week of Jan. 27 after starting his fundraising only two months ago. Kemp also helped Brendan promote his website on his Instagram page. At the time of publication, Brendan fundraised $10,085. Pat said he admires Brendan’s devotion to fundraising and training. Pat said Brendan embarking on this journey makes him proud, and he hopes to stand alongside the finish line to cheer him on.